Where will it be rebuilt? When will it be rebuilt? Temple Location: Is the traditional Temple Mount the original location of Solomon’s temple, or are those suggesting it wrong? This page isn’t meant to be an extensive study, but rather an overview with some links to other more thorough studies and sites and some things to look into deeper if interested. Prior to the existence of any Temple in Jerusalem or indeed Jerusalem itself, there was a relationship between the land of Jerusalem, Abraham and his seed. And they came to the place which God had told him of; and Abraham built an altar there, and laid the wood in order, and bound Isaac his son, and laid him on the altar upon the wood. And Abraham stretched forth his hand, and took the knife to slay his son. And the angel of the LORD called unto him out of heaven, and said, Abraham, Abraham: and he said, Here am I. And he said, Lay not thine hand upon the lad, neither do thou any thing unto him: for now I know that thou fearest God, seeing thou hast not withheld thy son, thine only son from me. And Abraham lifted up his eyes, and looked, and behold behind him a ram caught in a thicket by his horns: and Abraham went and took the ram, and offered him up for a burnt offering in the stead of his son. And Abraham called the name of that place Jehovahjireh: as it is said to this day, In the mount of the LORD it shall be seen. Here Abraham offered Isaac and tradition places the location at the top of Mount Moriah, which is the location of the Temple Mount today. David sinned (1 Chronicles 21 | 2 Samuel 24) and God gave him three choices for punishment. Three years famine, three months of Israel’s enemies defeating them or three days of pestulence in the land of Israel. David chose to fall into the hands of the LORD and so 70,000 men of Israel died. This was followed by David’s purchase of the threshingfloor of Araunah the Jebusite. And when the angel stretched out his hand upon Jerusalem to destroy it, the LORD repented him of the evil, and said to the angel that destroyed the people, It is enough: stay now thine hand. And the angel of the LORD was by the threshingplace of Araunah the Jebusite. And David spake unto the LORD when he saw the angel that smote the people, and said, Lo, I have sinned, and I have done wickedly: but these sheep, what have they done? let thine hand, I pray thee, be against me, and against my father's house. And Gad came that day to David, and said unto him, Go up, rear an altar unto the LORD in the threshingfloor of Araunah the Jebusite. And David, according to the saying of Gad, went up as the LORD commanded. And Araunah looked, and saw the king and his servants coming on toward him: and Araunah went out, and bowed himself before the king on his face upon the ground. And Araunah said, Wherefore is my lord the king come to his servant? And David said, To buy the threshingfloor of thee, to build an altar unto the LORD, that the plague may be stayed from the people. And Araunah said unto David, Let my lord the king take and offer up what seemeth good unto him: behold, here be oxen for burnt sacrifice, and threshing instruments and other instruments of the oxen for wood. All these things did Araunah, as a king, give unto the king. And Araunah said unto the king, The LORD thy God accept thee. And the king said unto Araunah, Nay; but I will surely buy it of thee at a price: neither will I offer burnt offerings unto the LORD my God of that which doth cost me nothing. So David bought the threshingfloor and the oxen for fifty shekels of silver. And David built there an altar unto the LORD, and offered burnt offerings and peace offerings. So the LORD was intreated for the land, and the plague was stayed from Israel. At that time when David saw that the LORD had answered him in the threshingfloor of Ornan the Jebusite, then he sacrificed there. For the tabernacle of the LORD, which Moses made in the wilderness, and the altar of the burnt offering, were at that season in the high place at Gibeon. But David could not go before it to enquire of God: for he was afraid because of the sword of the angel of the LORD. ... Then David said, This is the house of the LORD God, and this is the altar of the burnt offering for Israel. However, because David had shed blood and had many wars, God told him that he could not build a house in God’s name. This task was taken on by David’s son, Solomon. Then Solomon began to build the house of the LORD at Jerusalem in mount Moriah, where the LORD appeared unto David his father, in the place that David had prepared in the threshingfloor of Ornan the Jebusite. And he began to build in the second day of the second month, in the fourth year of his reign. During the time of the first temple, Israel continued the sacrifices and daily life, but grew apart from God and sinned. (Jeremiah 2) Prior to gaining the Promised Land they were given some specific instructions from God through Moses about how to treat the land. Furthermore the year of Jubilee was a year of freedom for the servant and a release of debt as detailed in the rest of the chapter. But while they were given these statutes to follow and promised the increases by doing so, they were also warned of the consequences of failing to follow them. But if ye will not hearken unto me, and will not do all these commandments; And if ye shall despise my statutes, or if your soul abhor my judgments, so that ye will not do all my commandments, but that ye break my covenant: I also will do this unto you; I will even appoint over you terror, consumption, and the burning ague, that shall consume the eyes, and cause sorrow of heart: and ye shall sow your seed in vain, for your enemies shall eat it. And I will set my face against you, and ye shall be slain before your enemies: they that hate you shall reign over you; and ye shall flee when none pursueth you. And if ye will not yet for all this hearken unto me, then I will punish you seven times more for your sins. Wherefore thus saith the LORD God of hosts, Because ye speak this word, behold, I will make my words in thy mouth fire, and this people wood, and it shall devour them. Lo, I will bring a nation upon you from far, O house of Israel, saith the LORD: it is a mighty nation, it is an ancient nation, a nation whose language thou knowest not, neither understandest what they say. Their quiver is as an open sepulchre, they are all mighty men. And they shall eat up thine harvest, and thy bread, which thy sons and thy daughters should eat: they shall eat up thy flocks and thine herds: they shall eat up thy vines and thy fig trees: they shall impoverish thy fenced cities, wherein thou trustedst, with the sword. Nevertheless in those days, saith the LORD, I will not make a full end with you. And this whole land shall be a desolation and an astonishment, and these nations shall serve the king of Babylon seventy years. And it shall come to pass, when seventy years are accomplished, that I will punish the king of Babylon, and that nation, saith the LORD, for their iniquity, and the land of the Chaldeans, and will make it perpetual desolations. Jeremiah’s ministry was from the thirteenth year of King Josiah in 626 BC until after the destruction of the temple in 587 BC, spanning the reigns of Josiah, Jehoahaz, Jehoiakim, Jehoiachin, and Zedekiah. Josiah was killed by Pharaoh Necho II in battle and was succeded by Jehoahaz, who was deposed after three months by Necho II, naming Jehoiakim as king. In 606 BC, Babylonian King Nebuchadnezzar besieged Jerusalem and Jehoiakim changed allegances to prevent the destruction of Jerusalem. Nebuchadnezzar took many captives of the nobility and some treasure as tribute. One of those led to captivity was a young Daniel and several others we read more about in the book of Daniel during their captivity in Babylon. Over the 19 years from the first to the third siege of Jerusalem, Israel didn’t repent and in 587 BC King Nebuchadnezzar made his final attack that lead to the destruction of the first temple on the 9th of Av. Scripture ages the first temple at about 372 years, but dates on the Exodus and Solomon’s reign are debated. And it came to pass in the four hundred and eightieth year after the children of Israel were come out of the land of Egypt, [~1,446 BC - 480 = ~966 BC] in the fourth year of Solomon’s reign over Israel, [~966 BC] in the month Zif, which is the second month, that he began to build the house of the LORD. (~966 - 7 - 587 = ~372 years) Josephus ages the first temple at about 470 1/2 years until its destruction. According to Rabbinic literature, the temple remained for 410 years. Regardless of the exact age of the temple, it was destroyed. In the descriptions of the temple instruments looted and brought back to Babylon in 2 Kings 25, one item in particular was missing, the Ark of the Covenant. Josephus recorded in 2 Maccabees that Jeremiah carried off the Ark of the Covenant prior to the sieges of Jerusalem. It was also contained in the same writing, that the prophet, being warned of God, commanded the tabernacle and the ark to go with him, as he went forth into the mountain, where Moses climbed up, and saw the heritage of God. And when Jeremy came thither, he found an hollow cave, wherein he laid the tabernacle, and the ark, and the altar of incense, and so stopped the door. There is also a belief that the Ark of the Covenant was hidden somewhere in the extensive cave systems beneath Jerusalem by Jeremiah somewhere, as put forth by The Temple Institute and furthermore they say there are some people who know where that chamber is. The fate of the Ark of the Covenant remains a mystery to this day. As a sidenote, there’s another fascinating study of a prophecy given to Ezekiel (Ezekiel’s 430 Days) that ties the first siege (Servitude of the nation) and the last siege (the desolation of Jerusalem) to the re-establishment of Israel as a nation on May 14, 1948 and the recapture of Jerusalem and the temple mount on June 7, 1967 respectively. I’ve linked some of the links to this fascinating study below. The beginning of the second temple was actually back in the fulfillment of God’s promise to bring Israel back after 70 years of captivity in Babylon. (2 Chronicles 36: 20-21 | Jeremiah 25:12 | Daniel 9:2) Some time after that fateful night when the handwriting was on the wall for Babylonian rule (Daniel 5), a prophecy of Isaiah written some 150 years earlier, was shared with Cyrus. That saith of Cyrus, He is my shepherd, and shall perform all my pleasure: even saying to Jerusalem, Thou shalt be built; and to the temple, Thy foundation shall be laid. Thus saith the LORD to his anointed, to Cyrus, whose right hand I have holden, to subdue nations before him; and I will loose the loins of kings, to open before him the two leaved gates; and the gates shall not be shut; I will go before thee, and make the crooked places straight: I will break in pieces the gates of brass, and cut in sunder the bars of iron: And I will give thee the treasures of darkness, and hidden riches of secret places, that thou mayest know that I, the LORD, which call thee by thy name, am the God of Israel. For Jacob my servant's sake, and Israel mine elect, I have even called thee by thy name: I have surnamed thee, though thou hast not known me. I am the LORD, and there is none else, there is no God beside me: I girded thee, though thou hast not known me: That they may know from the rising of the sun, and from the west, that there is none beside me. I am the LORD, and there is none else. The Servitude of the nation started at the time of Israel’s loss of independence. As God had promised that wasn’t the end for Israel and they would be redeemed from Babylon to return at the appointed time. For thus saith the LORD, That after seventy years be accomplished at Babylon I will visit you, and perform my good word toward you, in causing you to return to this place. For I know the thoughts that I think toward you, saith the LORD, thoughts of peace, and not of evil, to give you an expected end. Then shall ye call upon me, and ye shall go and pray unto me, and I will hearken unto you. And ye shall seek me, and find me, when ye shall search for me with all your heart. The fulfillment of God’s promise to Israel regarding the servitude of the nation came to pass after 70 prophetic years of captivity from the first siege in 606 BC to the decree of Cyrus in his first year after capturing Babylon. The timing of the fall of Babylon to Cyrus is around the end of the seventeenth year of the reign of Nabonidus in 539 BC. Belshazzar was co-regent of Babylon with his father, King Nabonidus and it was the celebration that both led to the handwriting on the wall in Daniel 5 and the stealthy takeover of Babylon that night while the city partied. When Cyrus released Israel from their captivity to return to Judea once again. So as rekoned in Babylon, Cyrus’s first year as king would have been in 537 BC. And them that had escaped from the sword carried he away to Babylon; where they were servants to him and his sons until the reign of the kingdom of Persia: To fulfil the word of the LORD by the mouth of Jeremiah, until the land had enjoyed her sabbaths: for as long as she lay desolate she kept sabbath, to fulfil threescore and ten years. Now in the first year of Cyrus king of Persia, that the word of the LORD spoken by the mouth of Jeremiah might be accomplished, the LORD stirred up the spirit of Cyrus king of Persia, that he made a proclamation throughout all his kingdom, and put it also in writing, saying, Thus saith Cyrus king of Persia, All the kingdoms of the earth hath the LORD God of heaven given me; and he hath charged me to build him an house in Jerusalem, which is in Judah. Who is there among you of all his people? The LORD his God be with him, and let him go up. The desolations of Jerusalem started with the destruction of Jerusalem, the temple and loss of Jewish Rule in Jerusalem. According to Jeremiah it was punishment for not yielding to the “Servitude of the Nation” which began in 606 B.C., with the first siege of Nebuchandnezzar. ... And it shall come to pass, that the nation and kingdom which will not serve the same Nebuchadnezzar the king of Babylon, and that will not put their neck under the yoke of the king of Babylon, that nation will I punish, saith the LORD, with the sword, and with the famine, and with the pestilence, until I have consumed them by his hand. ... But the nations that bring their neck under the yoke of the king of Babylon, and serve him, those will I let remain still in their own land, saith the LORD; and they shall till it, and dwell therein. Jeremiah 52:12-13 places this destruction 5 months into the 19th year of Nebuchadnezzar’s reign. In 605 BC, after the first siege of Jerusalem, Nebuchadnezzar II returned to Babylon to ascend to the throne after his father Nabopolassar’s death. This would put the third siege at 586 BC, but 587 BC is the accepted year of the destruction of Jerusalem. It may be that Jeremiah’s rekoning of his reign was from the first siege in 606 BC when Nebuchadnezzar took Jerusalem as crown prince at the time. Upon the four and twentieth day of the eleventh month, which is the month Sebat, in the second year of Darius, came the word of the LORD unto Zechariah, the son of Berechiah, the son of Iddo the prophet, saying, I saw by night, and behold a man riding upon a red horse, and he stood among the myrtle trees that were in the bottom; and behind him were there red horses, speckled, and white. Then said I, O my lord, what are these? And the angel that talked with me said unto me, I will shew thee what these be. And the man that stood among the myrtle trees answered and said, These are they whom the LORD hath sent to walk to and fro through the earth. And they answered the angel of the LORD that stood among the myrtle trees, and said, We have walked to and fro through the earth, and, behold, all the earth sitteth still, and is at rest. Then the angel of the LORD answered and said, O LORD of hosts, how long wilt thou not have mercy on Jerusalem and on the cities of Judah, against which thou hast had indignation these threescore and ten years? And the LORD answered the angel that talked with me with good words and comfortable words. So the angel that communed with me said unto me, Cry thou, saying, Thus saith the LORD of hosts; I am jealous for Jerusalem and for Zion with a great jealousy. And I am very sore displeased with the heathen that are at ease: for I was but a little displeased, and they helped forward the affliction. Therefore thus saith the LORD; I am returned to Jerusalem with mercies: my house shall be built in it, saith the LORD of hosts, and a line shall be stretched forth upon Jerusalem. The Jews, having been released by Cyrus, began to rebuild the temple. However, the antagonists around them didn’t want this. Now when the adversaries of Judah and Benjamin heard that the children of the captivity builded the temple unto the LORD God of Israel; Then they came to Zerubbabel, and to the chief of the fathers, and said unto them, Let us build with you: for we seek your God, as ye do; and we do sacrifice unto him since the days of Esarhaddon king of Assur, which brought us up hither. But Zerubbabel, and Jeshua, and the rest of the chief of the fathers of Israel, said unto them, Ye have nothing to do with us to build an house unto our God; but we ourselves together will build unto the LORD God of Israel, as king Cyrus the king of Persia hath commanded us. Then the people of the land weakened the hands of the people of Judah, and troubled them in building, And hired counsellors against them, to frustrate their purpose, all the days of Cyrus king of Persia, even until the reign of Darius king of Persia. Darius took the throne after Cambyses II death around September of 522 BC. Counting the ascension year, that would put Darius’s second year of reign in 518 BC. Then the prophets, Haggai the prophet, and Zechariah the son of Iddo, prophesied unto the Jews that were in Judah and Jerusalem in the name of the God of Israel, even unto them. Then rose up Zerubbabel the son of Shealtiel, and Jeshua the son of Jozadak, and began to build the house of God which is at Jerusalem: and with them were the prophets of God helping them. At the same time came to them Tatnai, governor on this side the river, and Shetharboznai and their companions, and said thus unto them, Who hath commanded you to build this house, and to make up this wall? Then said we unto them after this manner, What are the names of the men that make this building? But the eye of their God was upon the elders of the Jews, that they could not cause them to cease, till the matter came to Darius: and then they returned answer by letter concerning this matter. Ezra 5:6-17 is that letter sent to Darius I making sure he was aware the Jews were rebuilding the temple. They wanted Darius to double-check that the decree of Cyrus was really there. They were trying to cut the support for rebuilding the temple and justify stopping this work, likely doubting such a decree existed. Darius responded quite differently than they hoped. In the first year of Cyrus the king the same Cyrus the king made a decree concerning the house of God at Jerusalem, Let the house be builded, the place where they offered sacrifices, and let the foundations thereof be strongly laid; the height thereof threescore cubits, and the breadth thereof threescore cubits; With three rows of great stones, and a row of new timber: and let the expenses be given out of the king’s house: And also let the golden and silver vessels of the house of God, which Nebuchadnezzar took forth out of the temple which is at Jerusalem, and brought unto Babylon, be restored, and brought again unto the temple which is at Jerusalem, every one to his place, and place them in the house of God. Now therefore, Tatnai, governor beyond the river, Shetharboznai, and your companions the Apharsachites, which are beyond the river, be ye far from thence: Let the work of this house of God alone; let the governor of the Jews and the elders of the Jews build this house of God in his place. Moreover I make a decree what ye shall do to the elders of these Jews for the building of this house of God: that of the king’s goods, even of the tribute beyond the river, forthwith expenses be given unto these men, that they be not hindered. And that which they have need of, both young bullocks, and rams, and lambs, for the burnt offerings of the God of heaven, wheat, salt, wine, and oil, according to the appointment of the priests which are at Jerusalem, let it be given them day by day without fail: That they may offer sacrifices of sweet savours unto the God of heaven, and pray for the life of the king, and of his sons. Also I have made a decree, that whosoever shall alter this word, let timber be pulled down from his house, and being set up, let him be hanged thereon; and let his house be made a dunghill for this. And the God that hath caused his name to dwell there destroy all kings and people, that shall put to their hand to alter and to destroy this house of God which is at Jerusalem. I Darius have made a decree; let it be done with speed. Thus with the decree of Darius, was the 70 years of desolations of Jerusalem and the temple lifted and those that were working to bring a stop to the construction of the temple since the Decree of Cyrus were stopped. That didn't mean they were going to stop reaching out to successive kings regarding the rebuilding of Jerusalem. (Ezra 4:6-23) Note the chronology of Ezra 4 starts in the first few verses talking about a much earlier time than verses 6-23. See Frank W. Hardy’s The Chronology of Ezra 4. As for the temple, it was finished in 514 BC, with support from those that tried to stop them before because of fear of the king. Then Tatnai, governor on this side the river, Shetharboznai, and their companions, according to that which Darius the king had sent, so they did speedily. And the elders of the Jews builded, and they prospered through the prophesying of Haggai the prophet and Zechariah the son of Iddo. And they builded, and finished it, according to the commandment of the God of Israel, and according to the commandment of Cyrus, and Darius, and Artaxerxes king of Persia. And this house was finished on the third day of the month Adar, which was in the sixth year of the reign of Darius the king. And the children of Israel, the priests, and the Levites, and the rest of the children of the captivity, kept the dedication of this house of God with joy. And offered at the dedication of this house of God an hundred bullocks, two hundred rams, four hundred lambs; and for a sin offering for all Israel, twelve he goats, according to the number of the tribes of Israel. And they set the priests in their divisions, and the Levites in their courses, for the service of God, which is at Jerusalem; as it is written in the book of Moses. And the children of the captivity kept the passover upon the fourteenth day of the first month. For the priests and the Levites were purified together, all of them were pure, and killed the passover for all the children of the captivity, and for their brethren the priests, and for themselves. And the children of Israel, which were come again out of captivity, and all such as had separated themselves unto them from the filthiness of the heathen of the land, to seek the LORD God of Israel, did eat, And kept the feast of unleavened bread seven days with joy: for the LORD had made them joyful, and turned the heart of the king of Assyria unto them, to strengthen their hands in the work of the house of God, the God of Israel. It wasn’t until Nehemiah that a decree was made to rebuild the walls. The Jews were having difficulty rebuilding without the protection of walls. Ezra arrived in Jerusalem in the seventh year (Ezra 7:8) of Artaxerxes I (458 BC), followed by Nehemiah, who arrived in the king’s 20th year (445 BC) Nehemiah 2:1-11 It was during this period that the walls were built and the city fortified. Antiochus IV Epiphanes was a Hellenistic Greek king of the Seleucid Empire from 175 BC until his death in 164 BC. Over 160 years after Alexander the Great conquered the region, Antiochus looted the temple, massacred Jews and outlawed Judaism. In 167 BC, he ordered an an altar to Zeus erected in the temple and the sacrificing of pigs on the altar. This desecration of the temple and a desire to reject the Hellenistic culture led to the Maccabeean Revolt a year later when Judah Maccabee led an army that successfully outlawed Hellenistic Jews, destroyed the pagan altars and beat back the Seleucid armies. I was referred to the following information in the Fred P. Miller study on the 2300 Day Prophecy of Daniel 8. Now on the five and twentieth day of the ninth month, which is called the month Casleu, in the hundred forty and eighth year, they rose up betimes in the morning, And offered sacrifice according to the law upon the new altar of burnt offerings, which they had made. In 1 Maccabees, we are given a time that the abomination of desolation was setup. Later on we are given a similarly formatted time when the the first sacrifice at the rededication took place. Taking into account the 360 day prophetic year, we see the following vision of Daniel. Then I heard one saint speaking, and another saint said unto that certain saint which spake, How long shall be the vision concerning the daily sacrifice, and the transgressionH6586 of desolationH8074, to give both the sanctuary and the host to be trodden under foot? And he said unto me, Unto two thousand and three hundred days; then shall the sanctuaryH6944 be cleansedH6663. And it came to pass, when I, even I Daniel, had seen the vision, and sought for the meaning, then, behold, there stood before me as the appearance of a man. And I heard a man’s voice between the banks of Ulai, which called, and said, Gabriel, make this man to understand the vision. So he came near where I stood: and when he came, I was afraid, and fell upon my face: but he said unto me, Understand, O son of man: for at the time of the end shall be the vision. Using the Greek calendar according to Herodotus and assuming that the years 146 and 148 were intercalary years, we come up with the following calculation: 9-15-145 to 9-25-148, the dates given in Maccabees from the desecration to the cleansing, is three years and ten days. Thus, the math sentence following the Greek calendar which was in use at the time the prophecy was fulfilled would be: (3 X 360) + (2 X 30) + 10. Let's diagram it. This is exactly the period which would accomplish exactly 2,300 sacrifices, one in the morning and one in the evening! Given the above information, this may have been fulfilled following the abomination of desolation performed by Antiochus IV Epiphanes that is celebrated today as Chanukkah. Given that Daniel 8 seems to be a history of this time makes that possibility even stronger. King Herod’s reign was from 37 BC to his death, whose timing is debated. Many scholars accept his death to be at the end of March or early April in 4 BC. Evidence for the 4 BC date is that Herod’s sons who took over his kingdom that was divided, dated their rule from 4 BC. Herod was granted the title of King of Judea by the Roman senate and was a vassal king of Rome. During his reign, Jerusalem grew and large building projects included the Second Wall, the expansive and magnificent Temple Mount and the Antonia Fortress among them. Numerous palaces as well as public buildings, such as markets, a theater and a hippodrome, enhanced the city. In the 18th year of his reign, about 20-19 BC, Herod employed priests as masons and carpenters to comply with religious laws in the temple’s rebuilding. The temple was finished in about 1 1/2 years, but construction on outlying buildings continued for some time later. Recall that it was Daniel who was elevated above all these magi when he interpreted Nebuchadnezzar’s dream. (Daniel 2 uses the Hebrew word chartom “diviner, magician, astrologer, engraver, writer” to refer to the magitians, or magi) Then on the night of the fall of Babylon some 70 years later, Daniel is called before Belshazzar to interpret the writing on the wall. There is a man in thy kingdom, in whom is the spirit of the holy gods; and in the days of thy father light and understanding and wisdom, like the wisdom of the gods, was found in him; whom the king Nebuchadnezzar thy father, the king, I say, thy father, made master of the magicians, astrologers, Chaldeans, and soothsayers; Forasmuch as an excellent spirit, and knowledge, and understanding, interpreting of dreams, and shewing of hard sentences, and dissolving of doubts, were found in the same Daniel, whom the king named Belteshazzar: now let Daniel be called, and he will shew the interpretation. I feel it is highly likely that there was an understanding of Jewish prophecies within the ranks of the magi passed down from the time of the first captivity that made them aware of the promised Messiah. So when they saw the signs in the heavens, they went to go to see that promised King of the Jews. And when they were come into the house, they saw the young child with Mary his mother, and fell down, and worshipped him: and when they had opened their treasures, they presented unto him gifts; gold, and frankincense, and myrrh. And being warned of God in a dream that they should not return to Herod, they departed into their own country another way. And when they were departed, behold, the angel of the Lord appeareth to Joseph in a dream, saying, Arise, and take the young child and his mother, and flee into Egypt, and be thou there until I bring thee word: for Herod will seek the young child to destroy him. When he arose, he took the young child and his mother by night, and departed into Egypt: And was there until the death of Herod: that it might be fulfilled which was spoken of the Lord by the prophet, saying, Out of Egypt have I called my son. Then Herod, when he saw that he was mocked of the wise men, was exceeding wroth, and sent forth, and slew all the children that were in Bethlehem, and in all the coasts thereof, from two years old and under, according to the time which he had diligently enquired of the wise men. Following Herod's death, the events of the Gospel unfolded as Yeshua grew up in Israel and Jerusalem teaching the good news of salvation by faith and living the perfect life in order to sacrifice His life for His friends. (John 15) He taught around the temple, turned over the money changers at the temple and prophesied of its pending complete destruction. Following His death and resurrection, His disciples continued to spread the Gospel throughout Israel and beyond. Roman oppression, and with it Jewish resistance, intensified leading to a revolt. This was triggered by the zealots, who entered Jerusalem in 66 AD and held the city until the ninth day of the Hebrew month of Av, in 70 AD, when Jerusalem fell to the Roman legions under the command of Titus. This marked the end of the second 14,000 day period from the triumphal entry April 6, 32 AD to Jerusalem and the temple’s destruction on August 5, 70 AD. Being an eyewitness to the events, Josephus writes about many details of the fall of Jerusalem and the temple in The Wars of the Jews. Included in Josephus' writings was the final stand of the Jews at Masada. (The Wars of the Jews VII.8) Following the destruction of 70 AD a group of almost 1,000 radical Jews called the Sicarii led by Eleazor had captured the Roman fortress Masada that was built by Herod to use as an escape for himself. During the siege, from 73 to 74 AD, almost all of those Jews that were there committed suicide rather than be captured by the Romans besieging them. Josephus wrote of Eleazor's speech to those not willing to commit suicide, confirming the complete destruction of the temple. Following the destruction of Jerusalem, the Roman Emperor Hadrian announced plans to rebuild on the ruins of the city in 130 AD. He planned the city to be rebuilt and dedicate it to Jupiter Capitolinus. Furthermore, he renamed the city to Aelia Capitolina and built a temple to Jupiter on the Temple Mount. The city kept this name until 638 AD when the Arabs conquered it and kept the first part of the name, calling it Iliyā'. These plans, among other things, led to the Bar Kochba Revolt from 132-136 AD. Simon bar Kokhba, the commander of the revolt, was regarded by many Jews as the Messiah, who would restore their national independence. Over the course of the beginning of the revolt they met with success and an independent state of Israel was established over parts of Judea. However, in 135 AD the rebellion was crushed and the city was renamed Aelia Capitolina and Judea was renamed Palestine after the Philistines. The Jews were forbidden from entering Jerusalem until shortly after Hadrian's death when they were allowed to enter once a year on Tisha B'Av. On November 29, 1947, the United Nations General Assembly adopted resolution 181, the planned partition of Palestine following the end of the British Mandate. The plan was to divide Palestine into Jewish and Arab states following a withdrawal of British troops no later than August 1, 1948. While the Jewish Agency for Palestine accepted the plan, the Arab leadership and governments did not. Furthermore they made it clear that they would not accept any division of the land and any war would eliminate Israel from the land with some calling for their elimination from the earth. On December 4, 1947 it was decided that the British Mandate would end at midnight on May 14, 1948 and that the withdrawal of British troops would be completed by August 1, 1948. On May 14, 1948 David Ben-Gurion, the Executive Head of the World Zionist Organization and the chairman of the Jewish Agency for Palestine, declared Israel's independence and the establishment of a Jewish State to be known as the State of Israel as of the end of the British Mandate at midnight. 11 minutes after midnight, the United States recognized the provisional government as the de facto authority of the State of Israel followed by Iran and several other nations. To date most of the world has recognized Israel as a nation with a couple hold-outs that have never recognized her. This marks the only time in human history that a nation whose people were dispursed among the nations of the world for almost two thousand years came back together with the same cultural identity and language to reform that nation in the original land from which they were dispursed. The day after Israel's Declaration of Independence, Egypt, Jordan, Syria and forces from Iraq began their assult on Israel and after 10 months of off and on fighting, Israel held not only their land from the partition plan, but 60% of the Arab land. In the years following the war, hundreds of thousands of Jews were expelled from their Middle East nations and immigrated to Israel and it kept growing over time with Jews from around the world. On June 5, 1967, Israel preemptively attacked Egyptian forces built up along its border with Israel. In late May of that year Gamal Abdel Nasser had announed that the Straight of Tehran would be closed to Israeli vessels, something Israel had made clear would be an act of war. In these series of attacks, Israel wiped out the Egyptian Air Forces as well as taking the Gaza Strip and Sinai in ground attacks launched at that time. Syria and Jordan were then drawn into the war resulting in Israel taking over East Jerusalem and the West Bank from the Jordianians and the Golan Heights from the Syrians. On June 11 a ceasefire was signed and hostilities halted for a time. Israel captured the Temple Mount on June 7, 1967. (See pictures on that day) Later, Defense Minister Moshe Dayan, upon reuniting Jerusalem, permitted the Islamic authority, the Waqf, to continue its civil authority on the Temple Mount. The Waqf oversees all day-to-day activity there. An Israeli presence is in place at the entrance to the Temple Mount to ensure access for people of all religions. However, as we’ve seen since then, it doesn't take much to incite the Muslims whenever Jews try to go up there and there’s a long list of dos and don’ts to enter the Temple Mount. I just want to point out that the remainder of this page is pointing out some current events and Bible prophecy, but also includes speculation that may or may not be accurate. There is no doubt that there is a desire to rebuild the temple and that the Bible says there will be a temple in the last days, but where it will be exactly and how it will get there are still unknowns. I'm sharing my best guesses based on the research of others. The third temple does not exist yet. As of December 29, 2017 we are still waiting for the fulfillment of Bible prophecy in regards to the temple. There are, however, Preparations for a Third Temple being made and a growing desire to see it built. The Temple Institute is one such organization working for the creation of the sacred vessels and priestly garments. “...over sixty sacred Temple vessels have already been restored, including some of the most difficult and complicated projects, such as the Menorah and the precious stones of the High Priest's breastplate. The stones of the breastplate - recently created - were investigated with the help of professional gemologists, geologists and other experts. The wide range of material necessitated the examination of over 30 differing viewpoints for establishing the criteria for identifying the stones. So why even suggest that a third temple would be built? The answer comes in several scriptures that suggest events yet to come revolve around a physical temple in Jerusalem again. That hasn't existed since after 70 AD, therefore at some time in the future a temple must be built. The answer lies in Yeshua's reference to Daniel's 70 Weeks Prophecy regarding the last week of years determined for the people of Israel and the holy city. When ye therefore shall see the abomination of desolation, spoken of by Daniel the prophet, stand in the holy place, (whoso readeth, let him understand:) Then let them which be in Judaea flee into the mountains: ... For then shall be great tribulation, such as was not since the beginning of the world to this time, no, nor ever shall be. And except those days should be shortened, there should no flesh be saved: but for the elect's sake those days shall be shortened. These great tribulation passages that follow the abomination of desolation Yeshua spoke about are repeated in Mark 13:14-20 and that same unparalleled time of tribulation are mentioned in Jeremiah 30:4-7 and Daniel 12:1 when the restrainer leaves. These events described all revolve around the existence of a temple, including a temple that has not existed to this day. Neither of the first two temples were without the outer court, nor was it tied to a treading of the city and place where the outer court would be for 42 months (3 1/2 years). Taking scripture at face value and not spiritualizing it this means only one thing. Whether ordained by God or not, a physical temple defined in both terms of space and time will be built in Jerusalem without an outer court and it will be central to events in the middle of the 70th week of Daniel. The quick answer, I don’t know exactly. There is currently debate over the original location with interesting points made for each view, after all the temple was destroyed to the very foundations and the city destroyed and the people dispursed almost 2,000 years ago. I go into more detail of the various views on the Temple Location page. However, it may not really matter in the end where the original temple was if those building it are convinced that where they build it is the right location, even if it is not. For the purpose of Bible prophecy, the fact that it exists at all is what matters. The Word doesn't speak to a requirement that God ordains and blesses a temple to be built for religious reasons and expects sacrifices, just that it will exist as a central point in pivotal end-time events. To that end, accuracy in location may be a moot point. I just find it fascinating that we have no definitive answer but tradition as to where it was located before and recent archaeological discoveries that call some of that into question. While I don’t know exactly what will happen to get to a point where Israel as a nation is focused on rebuilding the temple, there are several key points from diverse prophecies that I believe may come together to bring it to pass. Before anything else, there must be a desire to rebuilt the temple. We’ve seen this more and more in modern history as increasing calls for a rebuilt temple are made and groups like The Temple Institute actively document and work toward providing everything that is needed to make it happen. Currently the groups pushing for a return to the Temple Mount are small, but they’re well on their way to provide all the instruments that will be needed to re-institute the temple activities. There are even rumors of the production of the blocks of stone being produced off-site in preparation so they would just need to be moved to the Temple Mount and assembled when the time comes. So not only does the desire for a rebuilt temple need to spread throughout all of the nation of Israel for it to realistically happen, but so too does the political climate need to allow it. Modern Judaism is still awaiting their Messiah. There is a belief that the man of sin described in scripture, the antichrist, will actually be a Jew of the line of David and fitting the prophecies of the conquering Messiah. Moreover, this Jewish Antichrist will be given power to conquer and those conflicts may be depicted in Daniel 11:36-45. We've already seen in 1948, 1967 and 1973 that Israel, however small, is able to take care of herself. Now what if command of that power was handed over to one that would enforce Israel's right to the Temple Mount? And the word of the LORD came unto me, saying, Take of them of the captivity, even of Heldai, of Tobijah, and of Jedaiah, which are come from Babylon, and come thou the same day, and go into the house of Josiah the son of Zephaniah; Then take silver and gold, and make crowns, and set them upon the head of Joshua the son of Josedech, the high priest; And speak unto him, saying, Thus speaketh the LORD of hosts, saying, Behold the man whose name is The BRANCH; and he shall grow up out of his place, and he shall build the temple of the LORD: Even he shall build the temple of the LORD; and he shall bear the glory, and shall sit and rule upon his throne; and he shall be a priest upon his throne: and the counsel of peace shall be between them both. And the crowns shall be to Helem, and to Tobijah, and to Jedaiah, and to Hen the son of Zephaniah, for a memorial in the temple of the LORD. And they that are far off shall come and build in the temple of the LORD, and ye shall know that the LORD of hosts hath sent me unto you. And this shall come to pass, if ye will diligently obey the voice of the LORD your God. I can see how those that don't accept Yeshua could see a strongman as the one to fulfill these prophecies, so it may be that the political issues will be brushed aside by the power given to the man of sin to forcibly take the Temple Mount from the surrounding Muslims and successfully fend off any attacks in a series of wars. In so doing, he may then rebuild the temple, confirm the Mosaic covenant and start the daily sacrifices. To the Jews, this deception would be great indeed and perhaps even those professing Christians ignorant of scripture. However it may be possible for events to be misconstrued such that people believe it is happening, even though it is not. If so, it could be the trigger event that both brings the nation of Israel together with a mind to rebuild, and also produce the kind of political climate that will cause the Muslim nations to back off, if even for only just a short while. Given that this very distinct and clear prophecy is a part of the Jewish scriptures, it is a source they would trust and believing God intervened on their behalf would greatly increase the aforementioned desire by the nation of Israel to rebuild the temple and come back into the relationship with God that they recognize, a pre-Yeshua scriptural belief complete with sacrificial system. I have little faith in this view as there are some specific things that would have to be brushed aside, such as Israel living in safety and unwalled villages. Then there's the great shaking of the land where mountains and "every wall" will fall as well as, hailstones, fire and brimstone that are rained down on them. Unless this is tied with the power given to the antichrist and the false prophet to call fire from heaven or something, I have a hard time believing a simple invasion being stopped would be mistaken for this prophecy. However it may come about, a temple will be rebuilt and I believe as time goes on, more and more Jews will become passionate in so building. Imagine also a discovery like the Ark of the Covenant coinciding with the rebuilding of the temple and I’m sure all of Israel would unite and do whatever was necessary to get their temple built. Not only that, but Aliyah into Israel would increase from all over the world. The Temple Institute already claims to know where the Ark is, awaiting the time to reveal it. Israel is still blinded until the fullness of the Gentiles. (Romans 8:25) Most don’t accept Christ and find Him offensive not only because of the blindness, but also due to past experience with "Christians" throughout history. So the only way they know to serve Him is the way of their fathers, this means rebuilding the temple and beginning the daily sacrifice, a necessary event for Bible prophecy to come to pass. There is another temple described which also hasn't existed to date yet and is much larger than the one that will be built just prior to the 70th week of Daniel. With all the destruction raining down during the wrath of God and all the earthquakes, it may very well be the third temple is destroyed during that time. And his [Christ] feet shall stand in that day upon the mount of Olives, which is before Jerusalem on the east, and the mount of Olives shall cleave in the midst thereof toward the east and toward the west, and there shall be a very great valley; and half of the mountain shall remove toward the north, and half of it toward the south. And ye shall flee to the valley of the mountains; for the valley of the mountains shall reach unto Azal: yea, ye shall flee, like as ye fled from before the earthquake in the days of Uzziah king of Judah: and the LORD my God shall come, and all the saints with thee. And it shall come to pass in that day, that the light shall not be clear, nor dark: But it shall be one day which shall be known to the LORD, not day, nor night: but it shall come to pass, that at evening time it shall be light. And it shall be in that day, that living waters shall go out from Jerusalem; half of them toward the former sea, and half of them toward the hinder sea: in summer and in winter shall it be. And the LORD shall be king over all the earth: in that day shall there be one LORD, and his name one. Ezekiel was written in the Babylonian captivity, 591 BC - 571 BC. Solomon’s temple was destroyed in 587 BC. In Ezekiel 40:1-4, he time stamps the text as being written 25 years after their captivity and 14 years after the city was destroyed, therefore after the destruction of Solomon’s temple. 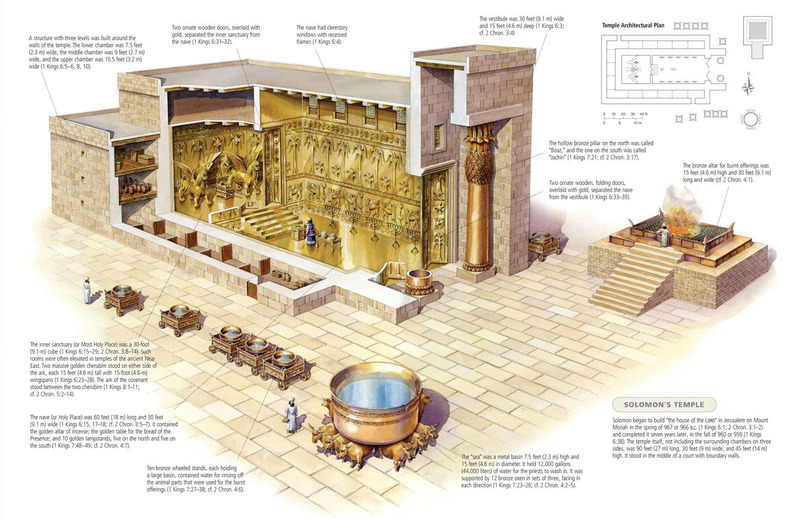 Ezekiel then goes on to describe a temple in great detail with 318 precise measurements and depictions of details. One important point to note is that this temple is too large to fit on the Temple Mount, in fact it's larger than either of the previous temples that we know existed and since the third temple will not have the outer court, it will be even smaller. This places Ezekiel's temple at some point outside of history and into the future beyond the 70th week of Daniel, the millennium. Thou son of man, shew the house to the house of Israel, that they may be ashamed of their iniquities: and let them measure the pattern. And if they be ashamed of all that they have done, shew them the form of the house, and the fashion thereof, and the goings out thereof, and the comings in thereof, and all the forms thereof, and all the ordinances thereof, and all the forms thereof, and all the laws thereof: and write it in their sight, that they may keep the whole form thereof, and all the ordinances thereof, and do them. This is the law of the house; Upon the top of the mountain the whole limit thereof round about shall be most holy. Behold, this is the law of the house. And he said unto me, Son of man, thus saith the Lord GOD; These are the ordinances of the altar in the day when they shall make it, to offer burnt offerings thereon, and to sprinkle blood thereon. And thou shalt give to the priests the Levites that be of the seed of Zadok, which approach unto me, to minister unto me, saith the Lord GOD, a young bullock for a sin offering. And thou shalt take of the blood thereof, and put it on the four horns of it, and on the four corners of the settle, and upon the border round about: thus shalt thou cleanse and purge it. Thou shalt take the bullock also of the sin offering, and he shall burn it in the appointed place of the house, without the sanctuary. And on the second day thou shalt offer a kid of the goats without blemish for a sin offering; and they shall cleanse the altar, as they did cleanse it with the bullock. When thou hast made an end of cleansing it, thou shalt offer a young bullock without blemish, and a ram out of the flock without blemish. And thou shalt offer them before the LORD, and the priests shall cast salt upon them, and they shall offer them up for a burnt offering unto the LORD. Seven days shalt thou prepare every day a goat for a sin offering: they shall also prepare a young bullock, and a ram out of the flock, without blemish. Seven days shall they purge the altar and purify it; and they shall consecrate themselves. And when these days are expired, it shall be, that upon the eighth day, and so forward, the priests shall make your burnt offerings upon the altar, and your peace offerings; and I will accept you, saith the Lord GOD. That’s a pretty detailed explanation of the sacrificing. Some may try to spiritualize the meaning so as to represent what feels more comfortable to their perceptions of reality, but I prefer to take the Bible for what it says. Thus saith the Lord GOD; No stranger, uncircumcised in heart, nor uncircumcised in flesh, shall enter into my sanctuary, of any stranger that is among the children of Israel. And the Levites that are gone away far from me, when Israel went astray, which went astray away from me after their idols; they shall even bear their iniquity. Yet they shall be ministers in my sanctuary, having charge at the gates of the house, and ministering to the house: they shall slay the burnt offering and the sacrifice for the people, and they shall stand before them to minister unto them. Because they ministered unto them before their idols, and caused the house of Israel to fall into iniquity; therefore have I lifted up mine hand against them, saith the Lord GOD, and they shall bear their iniquity. And they shall not come near unto me, to do the office of a priest unto me, nor to come near to any of my holy things, in the most holy place: but they shall bear their shame, and their abominations which they have committed. But I will make them keepers of the charge of the house, for all the service thereof, and for all that shall be done therein. But the priests the Levites, the sons of Zadok, that kept the charge of my sanctuary when the children of Israel went astray from me, they shall come near to me to minister unto me, and they shall stand before me to offer unto me the fat and the blood, saith the Lord GOD: They shall enter into my sanctuary, and they shall come near to my table, to minister unto me, and they shall keep my charge. And it shall come to pass, that when they enter in at the gates of the inner court, they shall be clothed with linen garments; and no wool shall come upon them, whiles they minister in the gates of the inner court, and within. Book: Messiah's Coming Temple: Ezekiel's Prophetic Vision of the Future Temple by John W. Schmitt and J. Carl Laney - One of the Old Testament’s most enigmatic prophecies is Ezekiel’s vision of a new, restored temple in Jerusalem. What would a restored temple be like? How would it operate? And when might it be built? These and many other intriguing questions are addressed in this newly updated and expanded work based on extensive research and discussions with leading Jewish leaders and rabbis in the United States and Israel. Messiah’s Coming Temple provides a thorough vision of this future center of worship during the coming messianic kingdom. Along with biblical interpretation of the key prophecies of Ezekiel regarding Messiah’s coming temple, the work includes photos and descriptions based on a unique and detailed model of the future temple constructed by author John Schmitt.